Personal Capital vs Mint: Which One is Right For You? If you know me by now, you probably know that I'm big fan of using technology for money management. Is this a symptom of my millennial-ness? Maybe, but I also think that millennials are just more willing to stay interested in personal finance if they have access to super-simple apps for money management. There’s nothing wrong with old school systems of pen and paper or even making your own spreadsheets, but that has never really worked for me if we're being honest. Enter Mint and Personal Capital. These two financial software heavyweights are changing the way we interact with our finances, and that’s a good thing. Plus, they’re both FREE. From what I’m seeing in my M$M FB Community, it sounds like a lot of you are using at least one of these platforms already. Nice work on keeping track of your finances! I’ve also been reading about Mint and Personal Capital in comments from readers and on other blog posts. I am seriously excited to know that so many people, not just millennials, are paying more attention to their finances. Everyone seems to have their favorite application, and a lot of that comes from which system offers the functionality you need for your financial situation. 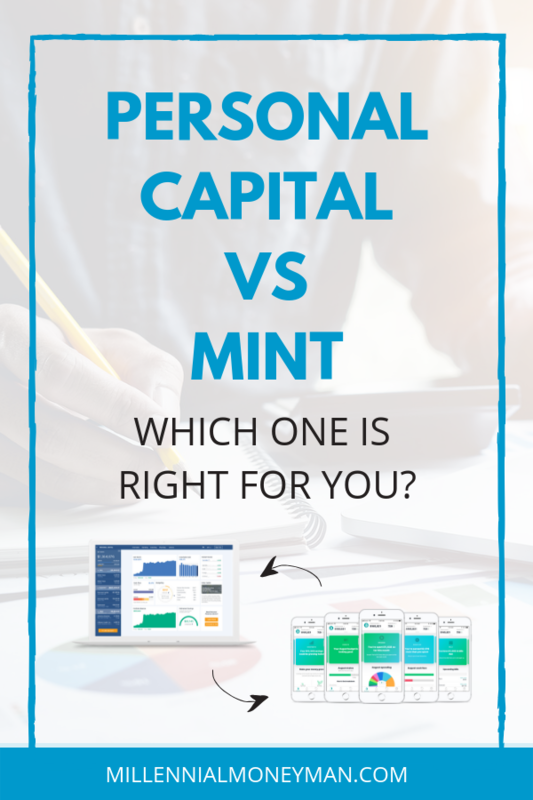 I’m signed up for both Personal Capital and Mint, and I really do think they are very different systems, both with the goal of helping you with your finances. Alright, let’s dive in and go over the basics of both today. Everyone’s financial situation is a little bit different, and your situation likely changes from year to year as your income grows and you begin to make long-term financial goals. There are other factors too, like job loss, changes in your family size, buying a home, paying off student loans, investments, etc. that all add to your overall plan. That’s a lot of stuff to keep track of, and I think that’s why some people aren’t doing it. I also know that it’s tough to sit down and track your money when there really isn’t much coming in or if you have a huge amount of debt sitting on your shoulders. Those, though, are the times when you need to track your finances the most. Well… you should ALWAYS be tracking them. 55% of Americans don’t have enough saved to cover a month’s worth of lost income. 54% of Americans say they have just enough or not quite enough to cover their monthly expenses. 36% of millennials say they are receiving financial help from their family. 22% of millennials have borrowed from their 401K. 62.2% of Mint users who set a budget stay under it. The Mint user’s average credit score is 705, compared to the national average of 673. The more active you are on Mint, the more likely you are to pay your credit card balances in full each month. UCLA researchers found that users of Personal Capital save 15% more than those who don’t use their service. Fortunately, both Mint and Personal Capital are available to anyone who wants to use them, and we’re getting to a point when there is really no excuse to be ignorant when it comes to your finances. I just want to be very clear before we start – both tools are really good in terms of helping you manage your financial accounts. Seriously, if you are keeping track of your finances in any way, you are on the upside of this issue. If you don't like using Excel spreadsheets or even pen and paper to track your money, you'll like either one of these. Both companies offer many of the same features, like two-step monitoring, cash flow monitoring, linked bank/brokerage/credit card accounts, and email spending alerts, but there are subtle differences that mean you might like one better than the other. Like I’ve already said, it sounds like a lot you are using both. Personal Capital was founded in 2009 and now has over 1.8 million users. They currently track over $550 billion in assets and manage over $7.5 million assets. Personal Capital's main task is tracking net worth and helping you prepare for retirement. 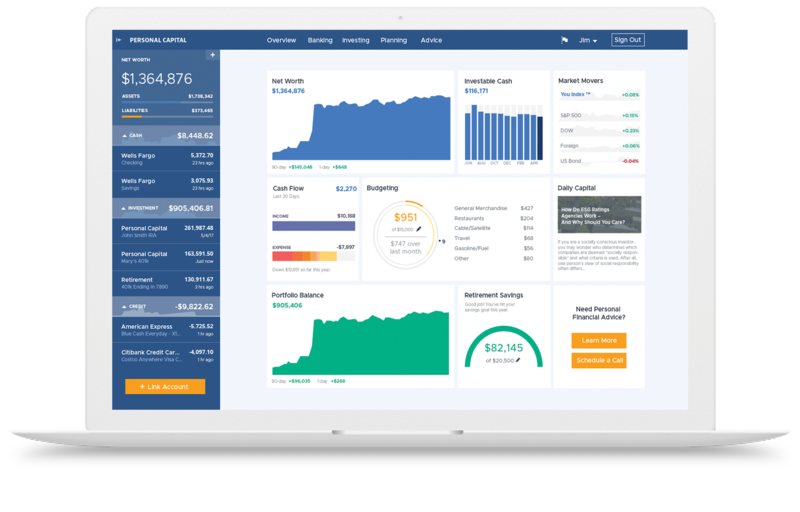 You can see on the dashboard (images provided by Personal Capital) that everything really focuses on your monthly cash flow and investment holdings. You can use the “+” sign in the top left corner to add in every asset you own (including real estate and cars) in order to get an accurate picture. Probably my favorite feature is that Personal Capital allows you to map out and plan for your future, and they do this with a cool asset allocation tool and easy to understand retirement planning functions. They basically take all of your investments, put them in one place, and allow you to look at them at the same time. Their net worth tracking is actually a really helpful way to see your overall financial picture. Why is your net worth important, find out here. The layout is very simple and super non-cluttered, which is what I like the most about it. You won't see any ads on Personal Capital. They make their money by providing financial advising services to high net worth individuals, but it's completely optional and you can still use the asset allocation tool without that particular service. Mint was founded a few years before PC in 2006 and were acquired by Intuit in 2009, and they’ve grown to over 10 million active users, seeing over 250 billion transactions per year. 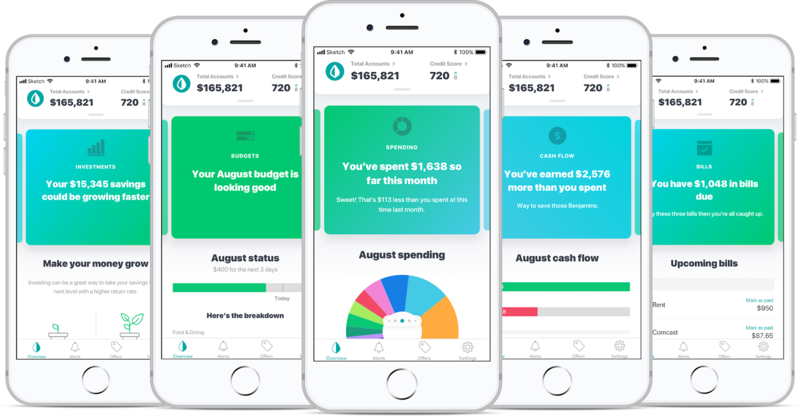 Like many of you were saying, Mint is a great tool for budgeting, and that’s really what their main goal is. Like Personal Capital, you can see all of your accounts on the dashboard, and their mobile platform is also very user-friendly. They send notifications when you have a new credit score, when you are going over your budget, and they let you set reminders for on-time bill payments. However, they did just get rid of their bill pay service (paying your bills through Mint) because not enough people were using that tool. Mint has, though, been working hard to declutter their dashboard, and I think that was a good choice. There are still ads at the top of the page, and Mint makes money by offering financial products and services to users (similar to what Credit Sesame does for your credit score). Mint recently released a sister product called Turbo. (Don’t confuse this with the online tax tool, which is also owned by Intuit.) While I haven’t used Turbo, the goal is to show you how you look to lenders using your verified income, credit score, and debt-to-income ratio. They also offer comparisons for motivation. The sign-up process for both tools is extremely simple. All you need is a valid email address and a strong password to get going. You'll have to link your bank account(s), and then both Mint and Personal Capital will update them in real time. I suggest gathering all of your account information before getting started. Trust me, this will help streamline the process even more, and if you’re not adding everything, you won’t get an accurate picture of your financial situation. As far as security, both sites have a version of two-factor authentication. The biggest thing to understand when using these services is that they are “read-only.” You can't make transactions through the programs, and they don't download personal information or account numbers. Personal Capital has great customer service. I've had several readers ask me questions regarding specific types of accounts, and every time I've called into PC they've helped me answer the reader's question. You know I love helping you, and I love when a company makes that super easy. Mint, on the other hand, doesn't have customer service, which is a little bit of a bummer. They do have support if you run into issues, but it doesn't seem to be very helpful in my opinion. This is where Mint shines! You can set budgets for items like groceries or gas and monitor whether or not you went over budget in a particular month, and this focus on budgeting is a really excellent tool for young people just starting out, those who want to get out of debt, etc. The entire platform is built around this functionality, and they are doing great with it. Personal Capital recently released a spending tool, but it isn’t nearly as functional as what Mint offers. Plus, it’s currently only available on mobile devices. Personal Capital really does well here. The application features your investment accounts that make up your portfolio making it easy to see if you're up or down in the market. You can connect your investment accounts on Mint, but they don’t offer the types of tools PC does, like the asset allocation tool, which really helps you with your planning. 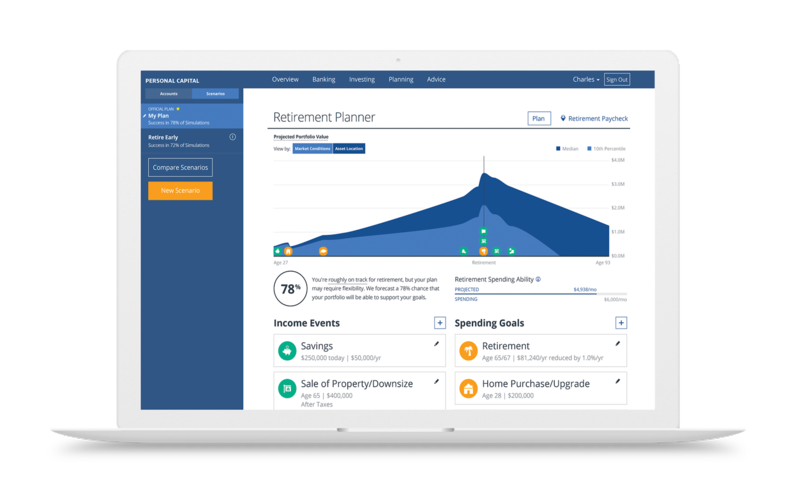 PC, unlike Mint, also has a retirement planner, which helps you project how much money you'll need to invest now to hit retirement age goals. It also includes a free analysis tool, which will show you where you are leaving money on the table with your various investment products. Personal Capital is definitely my favorite in this area, and as you saw earlier in this article, many of my readers feel the same way. Despite letting you connect your investments, Mint just doesn’t offer the same robust or easy to view tools as Personal Capital does. When it comes to choosing a winner for the Personal Capital vs. Mint test, overall, I think both of these tools are great. But personally, I'm going to stick with Personal Capital for now. I'm more interested in the retirement planning and I just like the overall look of Personal Capital. That might seem a little lame, but design matters to me. This doesn’t mean that you should overlook Mint, because they clearly offer an awesome budgeting tool, and you should check Mint out if you’re interested. If you're not sure which one you'd like, just try them both. They're free, so it's almost a no-brainer. Have you tried Mint and Personal Capital? What do you like about them? Images and statistics provided by Mint and Personal Capital. I use both. I started with Mint years and years ago, when it was first becoming popular and have had it ever since. I like Mint for tracking my expenses and spending, I think at this point, because I’ve finally gotten it the way I like it, I find it’s more accurate and less time consuming. I started using PC a little over a year ago. I prefer PC for tracking my investments and net worth. I tend to ignore the spending because I know it’s inaccurate (it qualifies my savings deposits as income, rather than transfers unless I tell it otherwise) but I love the charts. I also use two manual spreadsheets to track everything every month. The more data, the better! Oh wow you’re all over it haha! That’s great. I really don’t see any reason for not using both tools. I agree that the spending info is not that great on PC. I’m sure they added it in to compete with Mint, just like Mint added in investment trackers to compete with PC. Either way…they’re free. I feel like that erases all of the small negatives you know? Question for the experienced Mint users out there. Can you budget for future months? For instance, can I budget each month thru the end of 2017? It’s very important to me that I can see how my year is projecting to end up. Thanks in advance! I’m a big fan of Personal Capital as well. I tried to use Mint several years ago, but had difficulty linking all of my accounts. I’m sure that it’s much better now, as this was a while ago, but it was a big turnoff for me. If I have to manually update my accounts, then the tool loses a lot of value for me. For a tool like this, I’m much more concerned with investing and retirement planning than budgeting, so Personal Capital fits my needs much better. I love the You Index to track your investment performance relative to the S&P and Dow. The retirement planner is awesome as well. Great write-up on these tools. Thanks for sharing your thoughts! No problem! They are just so different in terms of functionality. I don’t think one is better than the other. We have a credit union that is a little tough to connect to both tools, but I think that is more of a product of the credit union having old technology than it is PC or Mint not working. Oooh, the second I read this headline I thought, “It’s on!” For me personally I prefer Personal Capital. I think Mint misses out on a lot of data and it’s not as well-rounded when it comes to looking at your budget holistically. Yeah I prefer it too, Mint just seems a little messy to me. I have a hard enough time keeping things organized as it is haha! I use both but I tend to use Mint way more. The reason is that Personal Capital doesn’t connect to all of my accounts, so unfortunately, I’m not able to get a full picture of my money. The main thing that Personal Capital doesn’t seem to work with is HSAs. I use my HSA as an stealth retirement account, but Personal Capital can’t seem to find it. I did reach out to them once about it and they indicated that they don’t support HSAs, and it seems like they haven’t added that functionality yet. Maybe you can use your sway to convince them!? For most people, it won’t matter all that much. I’d still say download both (I use both) and link up your accounts with them. I actually talked to them about your issue the last time I called in (I believe you mentioned it in my last review?) and they said that they support it. Obviously that doesn’t help if it’s still not working, but I’ll try again and see what they say! Odd, I have a tweet from their Chief Product Officer in 2016 where they told me that they don’t support HSAs. And I know at least in October of last year, my HSA at Fidelity never appeared in my dashboard, even though other Fidelity accounts did appear. Is there anyone out there who’s successfully linked up an HSA with Personal Capital before? As of today, I haven’t been able to do it. Big time Mint Man… Haven’t tried out personal capital. But, like u said it seems to be very good for tracking investments/retirement accounts. Mint recently added a new bill pay tool. I’ve yet to try paying bills through the interface, but do have all my bills linked up to it. I love that it gives me an overarching view of everything that I have due/have paid recently. Only downside I’ve had so far is from linking my lease whip to it (ya ya ik you hate them but I got a great deal 😉 ). It reflects the total cost of the car and not just my 2 year lease. I saw that bill pay tool, but we already have our stuff on a system. Don’t worry, I’m not judging haha! I’m a long-time Mint user, but I love reading about all of the additional features PC has to offer. The downfall is that my local bank and mortgage company are not supported through PC yet. Do you know how long (or how many requests) it takes for them to add a financial institution? Interesting – that is a downfall! I don’t know the specific number of times, but if you want to email me and let me know what the names of the banks are I’d be happy to ask them about it! I have both but prefer Mint. Mainly because it categorizes transactions better. There are more categories and you can create custom categories. Also, Personal Capital always incorrectly tags my transactions, ex credit card payments should be labeled “transfer” and not “expense”. That causes me to waste time adjusting where as Mint you can set certain purchases to always come in a a certain category. My favorite part of Mint is over time trending data and the ability to compare months or years spending/income. Maybe when I start investing more I’ll utilize Personal Capital though. Yeah it definitely seems that Mint is better at categorizing transactions. I think you’ll like PC for your investing. Good recap of two of the most popular financial apps out there. I think they’re both great and are very useful. Personally, I use both. Mint I check everyday, usually multiple times. I like to see all my spending transactions as they come in and I make sure everything is categorized properly. This keeps me up to date on our spending habits, and ensures there are no incorrect or fraudulent charges on our accounts. Personal Capital I check about once a week to get a snapshot of my networth and the graphs of how our investments are doing. I haven’t used the fee analysis or retirement calculators yet, but I definitely think those are valuable features. I love that both get updated automatically without needing to manually log transactions. I agree with you that the easier it is to get started, the more likely millennials will actually use it. I’ve heard great reviews about YNAB, but I just have no interest in keeping receipts and logging every transaction manually. Yeah I’ve heard good things about YNAB, but I’m the same. I hate keeping receipts if I don’t have to. I think it’s great that Personal Capital allows you to plan your retirement, but I like how easy Mint is to use and that it’s, for the most part, simple. When you first start out in trying to manage your money, I think that thinking too far ahead could overwhelm you. Once you know what you are doing, then I think switching to Personal Capital will help you take the next steps in your financial journey. Thanks for sharing your thoughts! It’s nice to read the comparison between PC and Mint, and to read all the comments for additional perspective. And to learn that there is yet another tracking/budgeting tool, YNAB (there are probably many more). Have you looked at Dave Ramsey’s free budgeting tool, Every Dollar? I’d love to know what you think. Hey Kathy! Glad you liked the post. Honestly I haven’t tried that one out yet. I have used Mint for about six years now. I wouldn’t say that I love it, but its purpose is to help me track my spending and provide a clean view of all of my accounts. And it does both of these tasks well. I haven’t had a good opportunity to test Personal Capital out because they did not support my 401(k) provider. However, the customer service team has been solid and they are working to support my 401(k) provider within the next few weeks! Oh wow that’s great to hear! Yeah they seriously do have good customer support. We LOVE Mint.com. We have been using it since our last year in college. We love that it allows lot’s of customization and customer support is always there if you need them. Great review! We were planning on doing an in-depth review on mint.com in the near future. Both tools looks great. I am in the searching process for a good budgeting/tracking/planning app, but both supports only US/CA users which is not a problem unless you live outside of the continent 🙂 Also I think in my country there is no chance that anything will sync transactions in the next decade so I have to log everything by hand (on paper so far). YNAB have a 34 days free trial period so anyone can try it. I think it is amazing, my only problem is that while it is great for tracking and budgeting it seems to me that they does not really have options for long term planning. Currently also experimenting with Buxfer too, it seems promising and its free. Do someone have any idea on apps which can plan for at least a year, but preferably 3-5 year period? Ok that’s it! You pushed me over the edge! Personal capital here I come. Based on your reviews, functionality is apples to oranges. Sure mint is great for budgeting, but I need more! Looks like Personal capital will be a great addition to my toolkit. No problem, I think you’ll like it! I have never used PC, but have been very happy with Mint for the 6 months or so I’ve been using it. To echo some previous posts though, I have also had issues linking all of my accounts, even though they are through major financial institutions. I personally prefer to just use a monthly budgeting tool that helps me keep track of how much I am spending and what category my spending falls in. It’s totally a psychological thing, but when I frequently checked up on all on all of my assets, I actually became less motivated to save. I became complacent that I am “in a good place” for someone my age and was more likely to splurge on things I didn’t need. Linking just my checking account, credit cards, and car loan to Mint challenges me to stay within my budget each month and view automatic deposits into my savings account and 401(k) as an “expense.” I’ll then check up on these other accounts about once a month. I use both applications for the specific purposes you’ve mapped out in your article. I have a bit more history with Mint, as I used it throughout college to help me manage my beer/food budget. Overtime the Mint functionality has drastically improved (for the better) and I use it every month to monitor and manage my miscellaneous budgets. I personally do better managing short-term money goals and seeing that savings rack up over time, so I really do prefer Mint. As I started getting more serious about the PF side of things I turned toward Personal Capital to help me manage my net worth and long term goals. Like you said, the net worth tracker is the best feature of the whole program and that’s what I exclusively use it for. So between the two, I get my yin and yang for my short term and long term money goals, and I’d recommend both to any of my family and friends! Hi guys I’m looking at Personal Capital , Mint , Quicken because we have rental properties and I think Quicken is the only version that tracks investment properties ? I don’t use either. We have used YNAB for a few years and I will gladly pay for the service. This tool has had such a positive impact on our life that it is such a small fee for what we have gained from it. Agreed with your comment above, Bobby, that Mint is “messy.” I always had trouble with it connecting to certain accounts and felt like there was too much information that was just “noise.” This was a few years back, though, so perhaps the system has gotten better. I have not tried Personal Capital yet but over the last few years have built my own Excel spreadsheet that tracks cash flow, credit cards, net worth, and a savings (not a spending) budget. Of course this requires my manual input but, at least for me, because I’m so invested in it, I’ve found this to be a much more effective way to track our family finances than relying on a third party. I think the bottom line is that “what gets measured gets improved” and you just need to find a measurement system – Mint, PC, your own spreadsheet, whatever – that works for you, your situation, and your goals.